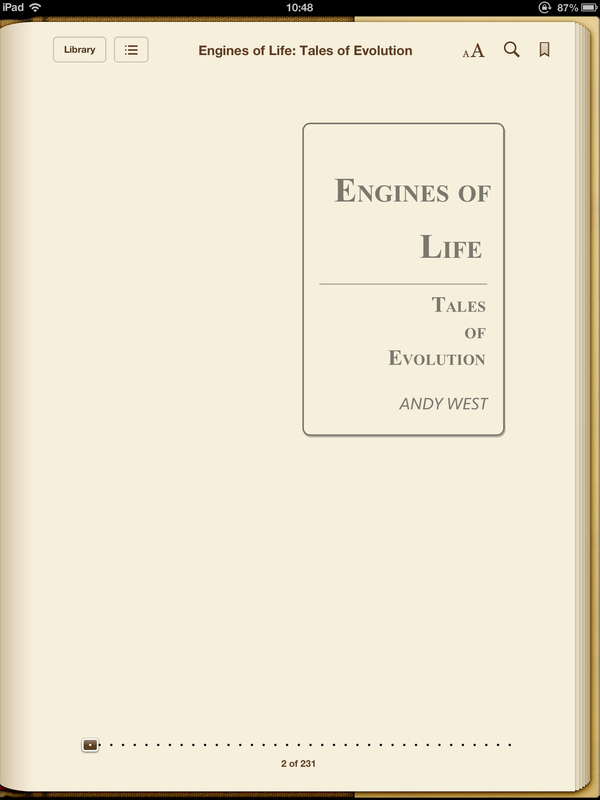 Andy West’s debut collection of philosophical science fiction, Engines of Life: Tales of Evolution, is now available in the ePUB format from Smashwords. Go treat yourself with the special launch price of 99cents. Here’s the ePUB edition of Andy’s book, looking rather neat in iBooks on my iPad. The title page might not look so neat on other ePUB readers. Apple’s iBooks has had pretty shambolic support for the ePUB standard, but I have to say they’ve got their act together and the most recent versions of iBooks have fixed a lot of problems and even started to support selected cuts from a more sophisticated form of styling called CSS3. That’s why iBooks now supports the curvy corners and shadowing you see above, the sort of thing you would take for granted on a Kindle Fire. Most other eReaders don’t support this fancy CSS styling, which is why curves and shadows and gray text might not appear on your eReader. It’s one of those scarily science-fictional aspects of eBooks: we publish books today that will improve the way they look over time because they make use of features that the likes of Barnes & Noble don’t support yet, but will do in the future. (Of course, the most science fictional thing about eBooks is that we now take for granted something that was pure fanciful speculation when Kirk and Spock used eReaders in the original Star Trek). This entry was posted in Book launch and tagged cheap ePUB, cheap science fiction ebook, cli-fi, CSS3, ePUB, hard sci-fi collection, hard sf, ibooks. Bookmark the permalink. 3 Responses to Hard sci-fi comes to ePUB… with curves! [Actually, I have fibromyalgia too, but fortunately low level and only flares rarely. Causes chest pain and arythmia when it does; permanently on mild beta blockers for the latter, works well].